Doctor Parsa Mohebi, founder of US Hair Restoration, is enrolling participants for the FUE vs Strip study at his Southern California hair transplant centers. The purpose of the study is to be able to make viable comparisons between the benefits of the follicular unit extraction (FUE) and strip method (FUT) of hair transplantation. The study will help identify the final hair quality, survival rate, and the comparison of the overall success of the two methods of hair transplantation. The FUE vs Strip study will be done around the world, including Los Angeles, Colorado, New York, Brazil, and India, in order to increase the sample size and provide more accurate results. Participants of the study will first need to meet with the hair transplant surgeon to identify if they are a good candidate for the study. After the procedure, all candidates will be required to go in for a 6 and 12 month follow up visit so that the hair transplant surgeon can evaluate the results. For a limited time, Dr. Parsa Mohebi is providing an incentive to all participants for the study, due to their dedicated time and commitment. For more information about the study, please call the offices of Dr. Parsa Mohebi at (888) 302-8747. The newest method in hair transplant known as Follicular Unit Extraction (FUE) is used to obtain hair grafts individually from the donor area. 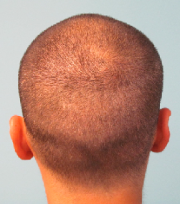 The donor area of the scalp is located in the lower back and side portion of the patient’s head. Patients who have their hair transplant using this method will not have a linear scar in the donor area of their head. This gives patients the option to cut or shave their hair to shorter lengths, as desired, without having to worry about the appearance of a scalp scar. There is a limited amount of grafts that can be transplanted per day with the Follicular Unit Extraction method. The grafts are harvested precisely and individually requiring more time to be spent on the extraction of the grafts. With this method transection of the hair follicles may occur damaging the follicular unit, causing fewer viable grafts to be transplanted. Choosing a hair transplant surgeon who is experienced in follicular unit extraction will help reduce your transection rate. Patients who have Follicular Unit Extraction will not experience any discomfort in the donor area after they have the surgery. The recovery of this procedure is minimal with fewer complications compared to the traditional strip method, because there are no staples or sutures to be removed, making the healing process faster. FUE is recommended for patients who wish to have the option to wear their hair short, as well as for patients who have significant scarring and inadequate laxity of the scalp.